Miami and North Miami Beach Personal Injury Law Firm Serving Bicycle Accident Victims in Miami-Dade and Broward Counties. Broward County: A Sunday morning bicycle ride ends in tragedy when a distracted motorist ran into a group of fourteen cyclist pedaling eastbound on State Road 84 near Southwest 148th Avenue. The 33-year female motorist claims to have been distracted by the morning sunlight when her Honda Fit crashed into the group of riders, who were riding in two columns along the right lane of the road. As a result, a 53-year old rider from Weston died from the injuries sustained while another rider, a 62-year old man, is reported in critical condition following the bicycle accident. 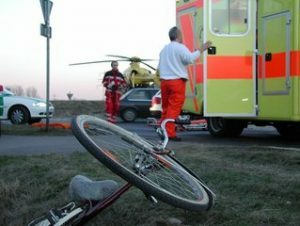 Several other bicycle riders were injured but all are reported to be in stable condition. The police are investigating the bicycle accident by analyzing the driver’s cell phone records to determine if negligent use of cell phone was the determining factor that led to the bicycle accident. According to the Davie police officer at the scene of the accident, the female motorists showed no signs of having consumed alcohol or narcotics prior to the crash. The Davie officer also stated the driver had mentioned being distracted and blinded by the early morning sun, which caused her to not see the pack of fourteen bike riders pedaling along Road 84. With only one prior moving violation for speeding, the incident is undergoing further investigation. Perazzo Law Shares insight Into Bike Riding on City Streets and Roadways.